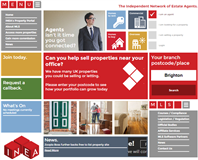 The INEA (Independent Network of Estate Agents) business model is based around the premis that estate agents want more properties to sell. And the best properties to sell are the ones that are closest to their agency. This is the main reason that the new INEA search engine is built around Google Maps with the option of diplaying properties in a grid. Agents can quickly and easily identify new "shares" near to their offices and start selling them at the click of a mouse. It doesn't get much easier than that! Try it for yourself by clicking here. The properties returned should be those shared properties which are closest to your current location. Our CMS enables you to change the content on your website instantly and easily all by yourself. Homewise is a specialist in equity release services. After just one year of trading Treasure Island Toys was short listed for the British Toy and Hobby Associations (BTHA) "Online Retailer of the year" in 2010. The rivals were Argos, Littlewoods Online, Amazon and The Entertainer. Google has said that the next step in Search is to put all the information onto a Map. The power of being able to show complex data within a geographic display, is that it makes it instantly comprehensibility.